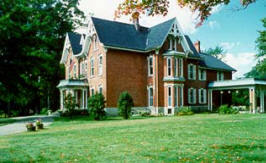 Brookside Manor is a small and intimate bed & breakfast set upon eight acres of garden that features a brook and pond. This beautifully restored colonial still has the original walk-in fireplace that dates all the way back to 1690. And whilst drinking an afternoon cup of tea near your very own fireplace, you just might spot the resident ghost. According to former innkeeper, Robert Vitale, the Brookside Manor has been reported haunted since 1965. He claims that since he purchased the property in 1998, several workmen and artisans experienced the ghost of Brookside Manor. It is believed that the ghost was Charles Fletcher, who was responsible for renovating a once simple farmhouse into a grand manor. Not much specifics have been yet reported about the Brookside Manor ghost, except for pillows disappearing and mysteriously reappearing. We're sure we will hear more in the years to come.